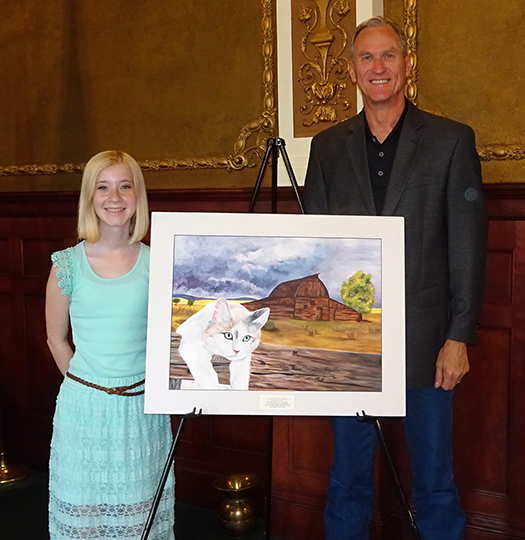 Camryn Bird of Sioux Falls, daughter of Corey and Tracy Bird, and granddaughter of Sue Larson, Woonsocket, entered an acrylic painting in the first Western Governor’s Association High School Art competition. Her interpretation of the competitions’ theme, Celebrate the West, depicts a beautiful South Dakota sky, an old barn and an adorable cat hanging on a fence. It’s entitled “Just Hangin’ Out.” The competition was for students attending a school in a WGA member state. Such states included were: Alaska, American Samoa, Arizona, California, Colorado, Guam, Hawaii, Idaho, Kansas, Montana, Nebraska, Nevada, New Mexico, North Dakota, Northern Mariana Islands, Oklahoma, Oregon, South Dakota, Texas, Utah, Washington and Wyoming. Camryn was awarded $200 for her winning entry for South Dakota. The winning entries from each state were sent to Colorado to represent each state present at the Western Governors’ Association meeting, where a second phase of judging occurred.